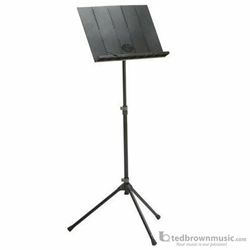 Portable "concert style" music stand, made with high strength tubular steel and nylon tension fittings. This light-weight, black stand easily adjusts to heights between 24.5" and 53" with a 20" by 13.5" folding polycarbonate desk. Rubber capped feet with positive leg locks and the only removable part is the desk ledge so you won't easily lose any part of the stand. The whole stand folds into a 24"x 6"x 6" canvas carry bag. Total weight is only 6 pounds making it easy to take anywhere.